Kia Motors Corporation in conjunction with its joint venture partner Dongfeng Yueda Kia (DYK) Motors, officially opened its second manufacturing facility in China at a ceremony in Jiangsu Province on Saturday 8 December 2007. The opening of the US$800 million state-of-the-art, fully integrated passenger car production facility indicates that expansion plans to boost overseas production to over one million by 2009 are on track and represents a pivotal step in the automaker’s goal to ensure long-term success in China. When in full operation, the facility will have an annual production capacity of 300,000, bringing total production capacity in China to 430,000. In addition to the 300,000-unit annual capacity Slovakia plant which began production in December of 2006, Kia’s overseas production capacity will be further boosted to 1,030,000 units annually with the completion of Kia’s first North American plant in Georgia, U.S. in the second half of 2009. “Today also signifies a very important milestone in the evolution of the Kia brand in the increasingly competitive Chinese market as Kia Motors strives to be among the top makers in China market by the end of the decade,” he added. In 2008, Kia plans to produce 100,000 units each at the two Chinese plants to meet its annual production and sales target of 200,000 units. By the time the second plant is operating at full capacity in 2010, Kia expects to sell 440,000 vehicles in the Chinese market through: the introduction of localized products that satisfy the tastes of Chinese consumers. The new plant began producing the Cerato sedan in October, with the 5-door hatchback version added earlier this month. Kia is also planning to introduce a new model for production at the new plant in 2009 and is currently assessing Chinese market trends and conditions before finalizing the next model. Currently, the new plant employs 1,400 workers and plans to add an additional 1,350 employees to bring the total direct employment by the plant to 2,750 people. This will bring the total direct and indirect employment through Kia investments in the area to 17,150 jobs including the 2,400 workers at the first plant as well as approximately 12,000 workers at supplier firms. 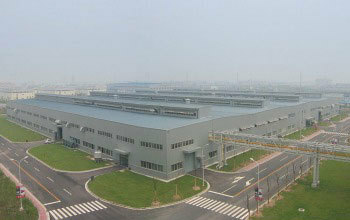 The new plant is situated on 1,470,000 square meters of land with 270,000 square meters of building space.